KITS Technologies Offers complete range of PABX / IP-PBX phone systems suitable for any modern business communication requirement. Our PBX solution offers extensive integrated functions and features to meet any demanding application. It sophisticated solution that comes all-in-one complete PBX solutions. Our solution IP-PBX offers built-in gateway capability to connect nearly all telecom interfaces like FXS, FXO, ISDN BRI, ISDN PRI, T1/E1, GSM and 3G. The solution comes with Registrar, Proxy, Voice Mail, Presence and IM Servers. Multi-Party Conference, Auto-Attendant, Digital Input Port, Digital Output Port, Analog Input Port, Analog Output Port, Remote Programming, and SMDR (CDR) with a large buffer capacity etc. are built into the system. Our Hospitality PBXs serves the specific requirements of Hotels, where specific hospitality requirement is needed. Our hospitality portfolio includes PBX for small hotel and motel, medium hotels and large hotels that can be installed at retails chains, hospitals. 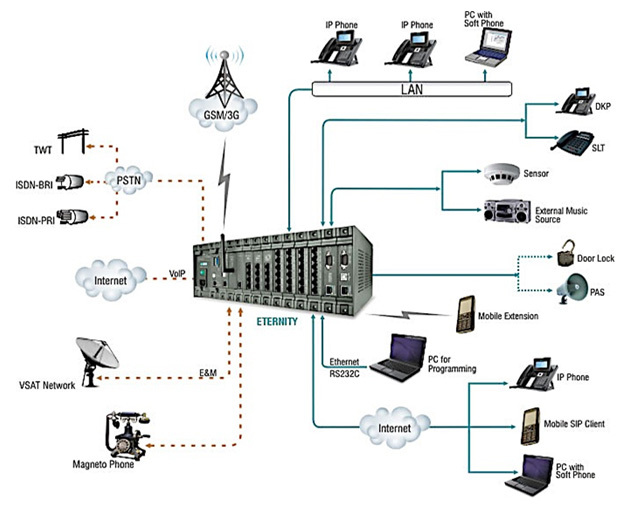 GSM network offers significant cost advantage and widespread coverage to the subscribers. The solution empowers organizations to take full advantage of GSM networks for making and receiving calls, while retaining their existing PBX. Besides voice telephony, the GSM FCT offers various services such as Short Message Services (SMS), Data Services (sending and receiving data files), Fax Services and Web Browsing. Please contact us now for a solution tailored to your requirement and environment.